Thyme (Thymus vulgaris L.), known as garden thyme, and T. serpyllum, known as creeping thyme, mother of thyme, wild thyme, and mountain thyme, are two similarly beneficial evergreen shrubs of the Lamiaceae or mint family. The aromatic thyme is a perennial native of southern Europe and the western Mediterranean. Thyme is extensively cultivated, both commercially and in home gardens, as a culinary and medicinal herb. There are hundreds of species of thyme. Garden thyme grows from a woody, fibrous root to produce thin, erect, stems up to 15 in (38 cm) high. It is most commonly cultivated for its culinary uses. Wild thyme is found growing on heaths, in sheep pastures, and mountainous areas in temperate regions. It was probably introduced to North America by European colonists, and has escaped cultivation. Wild thyme produces long, lowlying, sprawling and creeping stems. This habit inspired the designation serpyllum referring to the serpent-like growth of the species. 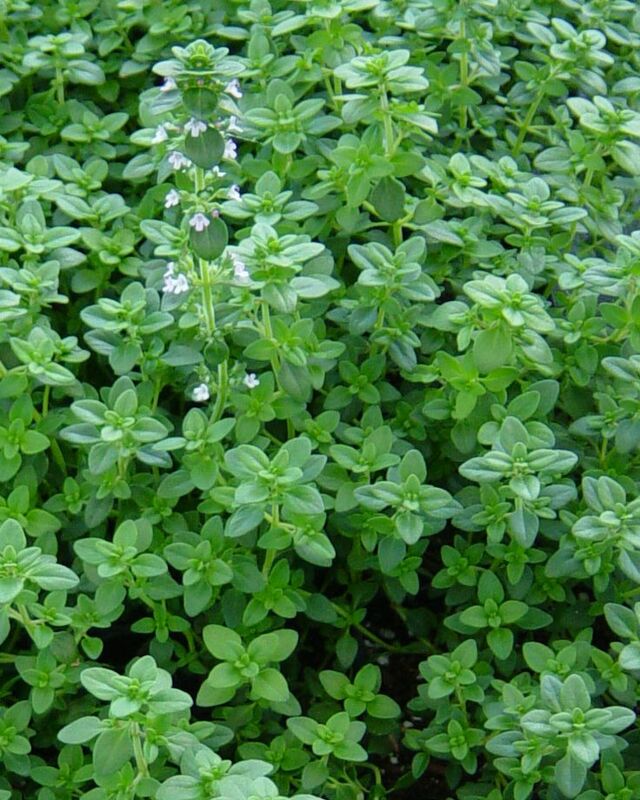 Thyme has tiny narrow gray-green leaves that grow in opposite pairs on the square woody stems. The edges of the stalkless, and slightly hairy leaves are rolled inward. The blossoms may be white to rose-colored or a blue to purple hue, depending on the species and variety. Flowers are tiny and tubular and grow in terminal clusters up to 6 in (15.2 cm) long. Flowering time is mid-summer. Seeds are minuscule and abundant. Thyme thrives in sunny locations on dry stony banks and heaths. The aromatic herb attracts bees that produce a uniquely flavored honey from the herb. It also acts to repel whiteflies. 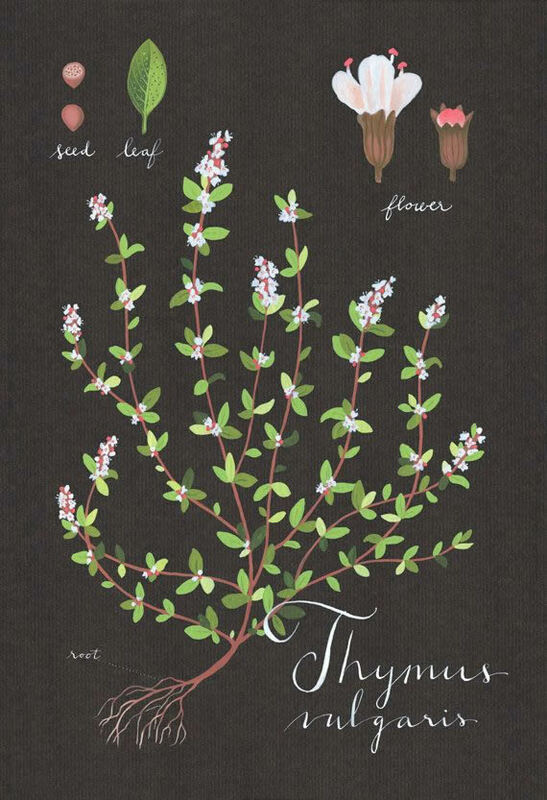 Thyme has been known since ancient times for its magical, culinary, and medicinal virtues. Tradition held that an infusion of thyme taken as a tea on midsummer’s eve would enable one to see the fairies dancing. Young women wore a corsage of blossoming thyme to signal their availability for romance. The generic name may have been inspired by one of thyme’s traditional attributes. Greek folk herbalists believed that thyme would impart courage (thumus in Greek) to those who used the herb, particularly soldiers. Greek men particularly liked the pungent scent of thyme and would rub the herb on their chests. The Romans believed that adding thyme to bath water would impart energy. They also included thyme in bedding to chase melancholy and to prevent nightmares. The strong scent of thyme was employed as a moth repellent, and burned as fumigating incense. The philosopher-herbalist Pliny the Elder recommended burning the dried herb in the house to “put to flight all venomous creatures.” In the kitchen thyme has been used for centuries to season sauces, soups, stuffing, and soups. Thyme has long been recognized for its antiseptic properties. The Egyptians used the herb in formulas for embalming the dead. The herb was among those burned in sickrooms to help stop the spread of disease. Oil of thyme was used on surgical dressings and in times of war as recently as World War I, to treat battle wounds. The fresh and dried leaf, and the essential oil extracted from the fresh flowering herb, are medicinally potent. Thyme is one of the most versatile herbs for use in home remedies. It is aromatic, antiseptic, diaphoretic (increases perspiration), analgesic, antispasmodic, and diuretic. It acts as an emmenagogue (brings on the menstrual discharge), carminative (expels gas), and stimulant. Thyme’s essential oil contains a crystalline phenol known as thymol, a powerful and proven antibiotic and disinfectant that enhances the immune system and fights infection. The aromatic and medicinal strength of the essential oil varies with the species harvested. The essential oil exerts a swift and effective action against bacteria. With external application, the essential oil is especially good for maintaining the health of the teeth and gums and relieving toothache. An ointment made with the essential oil is used to disinfect cuts and wounds, and is effective against the fungi that cause athletes’ foot. As a massage oil, thyme can relieve rheumatism, gout, and sciatica (pain along the course of a sciatic nerve, especially in the back of the thigh). As an ingredient in a lotion used as a chest rub, thyme will help break up catarrh (inflammation of the mucous membrane) of the upper respiratory tract. A strong decoction of the leaves and flowers, added to the bath water, will stimulate circulation. When used as a hair rinse, combined with a scalp massage, the herb decoction may help to prevent hair loss. Taken internally as an infusion or syrup, thyme is an effective remedy for ailments of the respiratory, digestive, and genitourinary systems. The herb relaxes the bronchial muscles, helping to quell dry coughs. The warm infusion can relieve migraine headache, colic, and flatulence, promote perspiration, and expel worms. A strong decoction, sweetened with honey, is good for easing the spasms of whooping cough and expelling catarrh. The infused herb can be used as a gargle for sore throat. 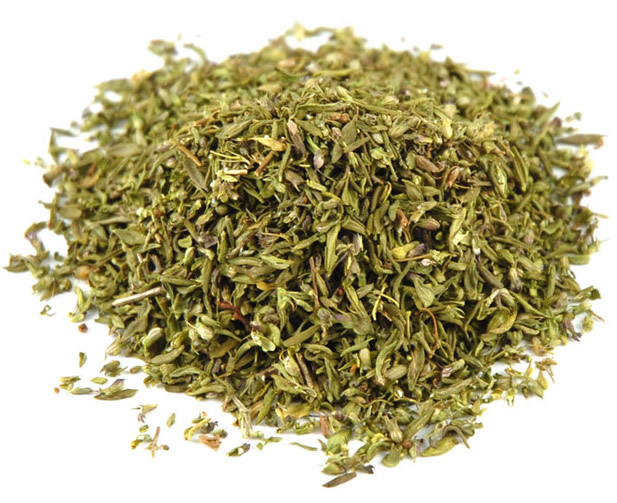 Taken warm, thyme tea will bring relief for menstrual pain, and relieve diarrhea. Thyme has an antioxidant effect and is a good tonic and digestive tea. The phytochemicals (plant chemicals) in thyme include tannins, bitters, essential oil, terpenes, flavonoids, and saponins. The aerial parts of thyme can be harvested before and during flowering. The leaves should be removed from the woody stems and placed in single layers on a paper-lined tray in a warm airy room out of direct sunlight, or hung to dry in bunches in a shady location. The dried leaf should be stored in dark glass, tightly sealed, and clearly labeled containers. Thyme can also be frozen for later use. Infusion: Two ounces of fresh thyme leaf (less if dried) are placed in a warmed glass container, and 2.5 cups of fresh nonchlorinated boiling water are added to the herbs. Twice as much herb is used in preparing an infusion for use as a gargle or bath additive. The tea should be covered and infused from 10-30 minutes, depending on the strength desired. After straining, the prepared tea will store for about two days in the refrigerator. Thyme tea may be enjoyed by the cupful as a tonic beverage taken after meals up to three times a day. Tincture: Four ounces of finely-cut fresh or powdered dry herb are combined with 1 pt of brandy, gin, or vodka in a glass container. There should be enough alcohol to cover the plant parts and have a 50:50 ratio of alcohol to water. The mixture is stored away from light for about two weeks, and needs to be shaken several times each day. The mixture is strained and then stored in a tightly-capped, dark glass bottle. A standard dose is onehalf to one teaspoon of the tincture, taken in hot water, up to three times a day. Essential oil: Commercial extracts of essential oil of thyme are available. These are not to be taken internally. The essential oil must be diluted in water or vegetable oil, such as almond or sunflower oil, before applying to minimize the toxicity. The oil contains thymol, a component in many commercially available antiseptics, mouthwash, toothpaste, and gargle preparations. It is antibacterial and antifungal. Very small amounts of thyme used in culinary preparations are generally safe. In large amounts, thyme acts as a uterine stimulant. Pregnant women should not use the herb, tincture, or essential oil of thyme. Excessive use of undiluted essential oil is toxic. If the oil is ingested, it may cause gastrointestinal distress such as diarrhea, nausea, and vomiting. Other adverse toxic effects may include headache, muscular weakness, and dizziness. The oil of thyme may act to slow the heartbeat, depress respiration, and lower body temperature. Applied externally in undiluted form the essential oil may cause skin irritation. The oil should be diluted before use. The U. S. Food and Drug Administration (FDA) has rated thyme as “food safe.” The PDR For Herbal Medicine lists “No health hazards or side effects” when the herb is properly administered in designated therapeutic dosages.